Thunderstruck II by Microgaming is the long awaited follow-up to its predecessor, Thunderstruck. The sequel has proved to be worth waiting for and improves on the original in every way. Play as the original hero Thor plus a whole host of other characters including his brother Loki, the god of war and death and Thor's father, Odin as well as Valhalla. 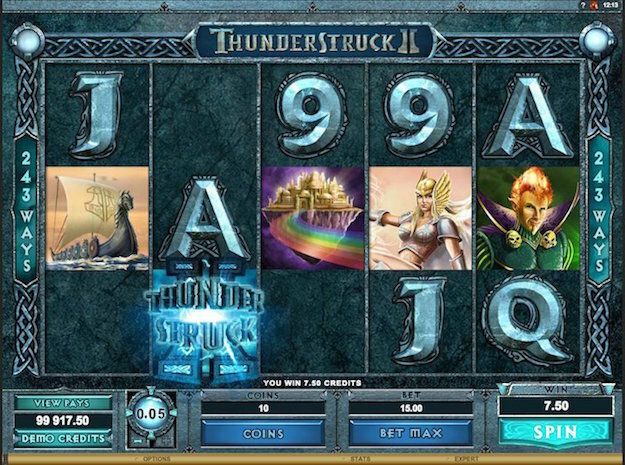 Thunderstruck II has since become one of Microgaming's most popular games full of amazing features and stunning visuals. Intrigued? 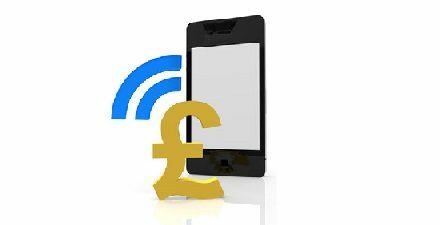 Read our Thunderstruck II mobile slot review to find out more. With a range of enticing features, beautiful visuals, awesome sound effects and a whopping 243 paylines to get stuck into, Thunderstruck II is a world-beater in the video slots universe. The straightforward gameplay is ideal for newcomers or seasoned players. The allure of Thor and Norse mythology is as popular as it ever has been thanks to the Avengers films, and this game provides a little more in the way of Thor and the other gods. And they are all represented on the reels alongside Asgard, the capital city of the Norse Gods as well as the famous Longship. The Thunderstruck II logo represents the the wild symbol, while Thor’s Hammer is the scatter symbol. In fact, the video slots world's fascination rumbles on with Golden Goddess, another mythological-themed slot that is engrossing and addictive all at the same time. Here are the basics: Thunderstruck II is a five reel video slot with 243 different paylines available to the player. The maximum £1,000 jackpot is slightly disappointing with the minimum bet of 1p and maximum bet of 5p reflecting this, but the gameplay more than makes up for this. Players can bet up to ten coins per line and the payouts are multiplied by the coins wagered per line in the case of a win. The total bet per spin is 30 times the line bet. A number of special features include the Thunderstruck II logo, which is the wild symbol and doubles a payout when it aid in making a winning combination. The Wildstorm feature begins randomly and can change up to five reels wild. The scatter symbol belongs to Thor’s Hammer and two or more scatter symbols offer payouts that are multiplied by the final bet. Three or more scatter symbols anywhere on the board gains the player entry to the hallowed Great Hall of Spins. Once in there, four extra spins games are granted. The first four times the feature is triggered, gamers are presented with the opportunity to play the Valkyrie game, 5th to 9th triggers enable the Loki feature, 10th to 14th triggers begin the Odin feature and the 15th trigger opens up the Thor feature. One of the game's unique elements is its ability to remember where players left off, courtesy of a progression chart. So if you need to leave at a certain point, your progress will be saved and you can carry on without having to start again. All achievements are even stored, so no need to fret about losing all of your hard-earned bonuses! Microgaming has made sure that Thunderstruck II is better in every aspect than its wildly popular predecessor. And this includes its features which take the slot into the stratosphere thanks to its fantastic features that include Wildstorm and the Great Hall of Spins. This feature is randomly activated and any of the reels can become wild, allowing games the chance to exponentially increase their winnings. This feature also includes a extra spin feature that has players working through different levels in order to achieve the highest win plus golden achievement awards. The feature earns players one extra spin with up to five reels turning wild. If the player gets four or more wild reels, a big win will be in their future. Want to play Thunderstruck II? Thunderstruck II Thunderstruck II is infinitely better than Thunderstruck in every single way. Over the several years of anticipation that built among its dedicated fanbase, no one could have seen how Microgaming would improve on it, but they did. The stunning visuals, smooth gameplay and compelling audio make the game an addictive one, players can easily spend hours on it. The features including the Great Hall of Spins and Wildstorm offer up various bonuses across the very generous 243 paylines, but the maximum £1,000 win is a slight disappointment for such an advanced, atmospheric game. Regardless, Thunderstruck II is one of the all-time great video slots games. If they decide not to make a Thunderstruck III, then I'm sure fans won't be too disappointed. This is why we're giving the game a well-deserved four out of five stars.